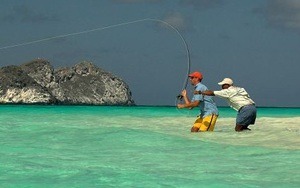 Fly fishing in Los Roques is both amazingly adventurous and exciting. 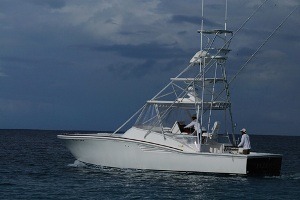 Los Roques combines sunshine, vast amounts of sea life and sandy beaches to make it such a popular flyfishing hot spot. Los Roques is more than just relaxing on the beach. For people who like fishing it is a paradise. The islands are one of the top spots and destinations for those who are interested in fly fishing. For these people we created a journey. In this Los Roques package, you will stay 1 week in a Superior Posada, directly in Gran Roque. You will have 5 exciting Los Roques fly fishing days on a private boat and with an experienced guide. The guide is also a specialist in fly fishing. Do not hesitate and speak with our agents. This fishing adventure is waiting for you! We organize your fly fishing Adventure ! In Los Roques, all fishermen using fly are lucky when fishing, whether it is a Ubarana-rat-muzzle, bonito or licenças, all these species feel at home in the Caribbean. Fishes are between 19 to 31 centimeters long and, with this size, they are undoubtedly good fighters. Small fish species live in groups; big fishes tend to live alone. The Ubarana-rat-muzzle swims close to foraging on the coral islands of Los Roques archipelago and can be fished in shallow water. The Ubarana-rat-muzzle fish weighs 8-12 kilos more than that found in Yucatan or Belize. Catches of 10 Ubarana-rat-muzzle fishes a day are not uncommon; with some practice, you can fish up to 20 of these fishes per day. Shoals in Los Roques are large and swim on the sand at the bottom of corals. In the islands, fishermen can find many different ways to fly fishing. Check out fly fishing and check the traditions of the archipelago by ensuring your trip to Los Roques as an unforgettable trip. In the archipelago of Los Roques, many of the fishing areas are in shallow waters and are accessible only with the accompaniment of specialized fishing guides. Do not forget your fishing rods, Class 7/8 and 10/11, sturdy saltwater wheels with excellent brakes, each backing 200m and fly floating saltwater lines for your fishing trip in Los Roques. During the winter months, several shoals of sardines come to shallow waters, and predators, such as bonitos, jacks, tarpon and Ubarana-rat-muzzle can easily get food. In this same environment, visitors can see a variety of seabirds over the ocean. Fishing destinations in Los Roques provide perfect conditions for fly fishing, kite surfing or diving, as well as a wonderful family holiday. In addition to tours aboard a boat or more than a day for fly fishing, we provide complete travel fishing arranged to various destinations in Venezuela, close to the Los Roques coral archipelago. We also recommend the Orinoco Delta along with a special Lodge, which is located very close to the Atlantic Ocean and the Amazon state, with its rivers still relatively untouched. These are adventure tours that will surely be a unique experience. We will be happy to help you with more information on fishing in Venezuela. Each 26-feet long fiberglass boat has a captain and a guide, and there are at most two fishermen on board. Fishing spots vary every day and are 30-60 minutes away from Gran Roque, but the fisherperson can also choose where he/she would like to fish. All boats have life jackets, a cell phone, and coverage area. These tours can be arranged at any inn. Our partner has more than 20 years of experience.